Of exceptional quality, it is one of the rare wines to be able to honor … the hypotoxic and tonic cuisine as it is available with panache at Spa Eastman. When an establishment prioritizes overall health and wellness, it is only natural that this is reflected in its own cuisine first and even in its wine list. We would not expect less. Gerard Marinovich was quick to understand this. The wine list he composed for the Spa includes a fine selection of wines from all sources, mostly organic, that is to say, made from grapes grown without any chemical additives. Also, anxious to source locally as much as possible, he reached out to local producers interested in working according to the principles of sustainable agriculture or biodynamics. July 2016. 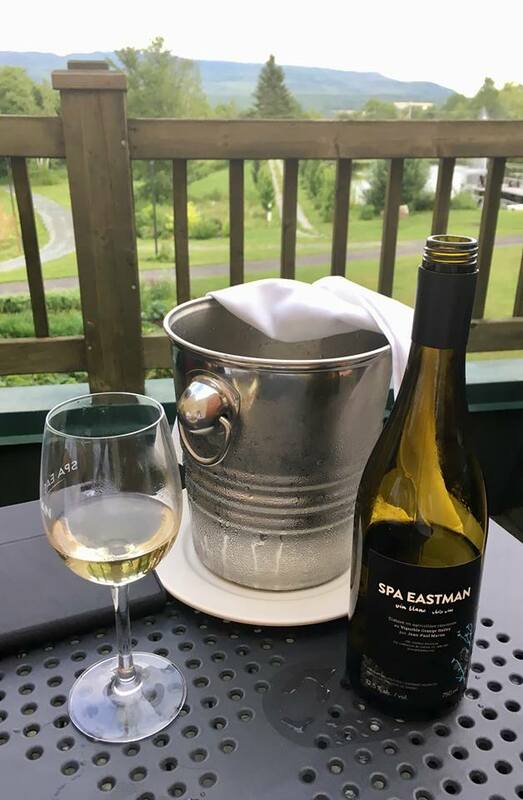 I had the opportunity to taste the first white wine of the Cuvée Spa Eastman. 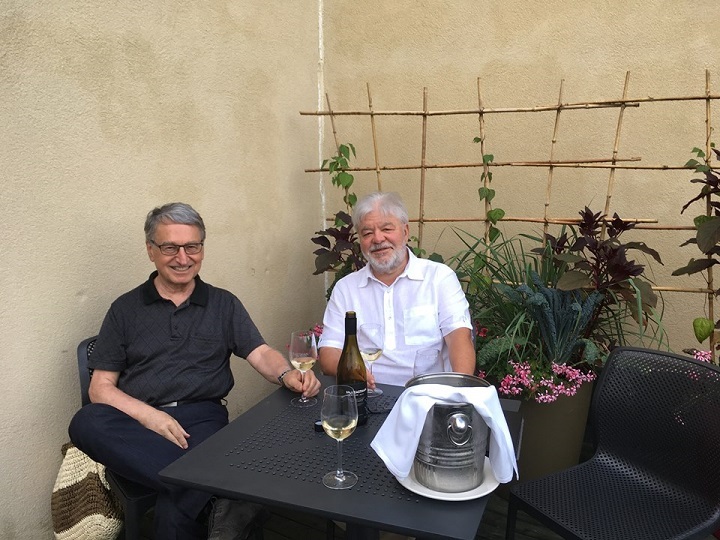 That day, I came to hear the lecture by Mr. Gérard Marinovich, VP of Spa Eastman and unrepentant oenophile. It concerned organic certification, natural wines, those cultivated in biodynamic and sustainable agriculture. And on the difference between an industrialist, a conglomerate and a winemaker. “One cannot speak,” he said, “of perfect grapes if one demands from the vine excessive yields or if one indiscriminately sprays it with pesticides and other indiscretions. Take a look at our wine list and you will see that the majority of the wines are organic. You will even find one that is produced in the immediate area by one of the best artisans in the profession. What wine was it, I wanted to know, I wanted to taste it and I did. Three times rather than one! It is a rare privilege to have tasted the first three cuvees of this somewhat confidential wine, knowing that the annual production of the Grange Hatley, the vineyard that produces it, barely exceeds5,000 bottles. All varieties combined! And on that, you wonder, how much of the Cuvée Spa Eastman‘s white? I cannot say exactly, but too little certainly to hold until the next cuvee, even if the quantities have increased from one cuvee to another. Tasted a year apart, the two previous ones had seemed very different. The first had made an impression, easy and refreshing, the kind that you consume without moderation on a beautiful summer day. This wine reminded me of a distant stay in Corsica. We bought directly from producers a delectable little Muscat all round, all perfumed, which was perfect for us. Rarely have I found the same pleasure to enjoy a fresh, delicate, so petulant and harmonious wine. However, Muscat did not fit into the composition of it and that was what surprised me the most! Last year’s one seemed more complex, more robust and more serious. It is as if, by a clever mix of five grape varieties, Riesling, Pinot Gris, LaCrescent, St-Pépin and Vandal Cliche, the cellar master had wanted to make it evolve, as if he had sought to make it pass from the aperitif to the table. A work of magic, no doubt, but as much as you say, the quality of the emotion felt was not quite the same. It’s quite personal, I agree. This year, the Vandal Cliche is no longer in the recipe and I am convinced that the dosages have been readjusted with great care. As a result, this wine is about midway between the other two and, in my opinion, it is the most balanced, the most finished and the best of the three. A roundness that “silently” envelops the taste buds and just enough energy to sit at the table. Originally from Burgundy, who arrived in Quebec in 1992, he first worked as a trainer at the Institute of Agri-Food Technology and then as a consultant in viticulture and winemaking with various Quebec vineyards. He is a cellar master at the renowned Domaine les Brome since March 2000, and cellar manager for Les Vallons de Wadleigh. Since 2009, he owns the Grange Hatley vineyard with 3600 vines, St-Pépin, Riesling, Pinot Grigio and LaCrescent, all grapes expressing their aromatic qualities in a cold climate and a rather short ripening season. Perfect conditions to make great white wines! The products of the vineyard are present on the wine list of several large restaurants in the Eastern Townships: Auguste, Bistro Quatre Saisons in Orford, Lo Ré, Manoir Hovey and Spa Eastman, under house label. The Cuvée Spa Eastman is only found at the Spa. It is far from being unpleasant. For the original blog post (in French), click here.